Before .Net managing Active Directory objects is a bit lengthy and you need a good knowledge on the principal store to have your head around on what you want to do. We ususally use the System.DirectoryServices namespace but with .Net 3.5 they introduced System.DirectoryServices.AccountManagement which is manages directory objects independent of the System.DirectoryServices namespace. So what are the advantages of using this if I have already a library created for the whole AD Methods that System.DirectoryServices exposed? Because everything is really simple in terms of managing a user, computer or group principal and performing queries on the stores are much faster thanks to the Fast Concurrent Bind (FSB) feature which caches the connection which decreases the number of ports used in the process. ValidateCredentials – This Method will validate the users credentials. IsUserExpired – Checks if the User Account is Expired. IsUserExisiting – Checks if user exsists on AD. Now this is how to use it. One question, could you show a nice example of editing an existing user? using this code i am able to create new user but with blank password, code is creating user with blank password. Also i need to create user with Admin privilages (should be memebr of Administrator). Do you have an example of using any of the other methods like removing user from a group, adding user to a group. You can use this two methods RemoveUserFromGroup and AddUserToGroup, the parameters are only User Name and Group Name, if it doesnt find any it returns a boolean variable. I am trying to hook up with Active directory to get the Group of the user using System.DirectoryServices.AccountManagement. When I am running the Application from VS2010 it Authenticate user and Display the Group as well. But when I am browsing application from IIS 5.1 it showing error while checking the group. Can you give me your codes on GetPrincipalContect part so I can debug it properly. Please find the code of GetPrincipalContect as given below. Looks like you are using PrincipalContext(ContextType, String) where the or your “TEST1” will be the name of the domain or server hosting the ApplicationDirectory instance. Which means the application will set the default username and password when the instance of the Principal Cotnext initializes, this will be fine on your machine as it will inherit your user who is logged in to the machine but when using IIS if you are not using Integrated Windows Authentication with the Anonymous Access off then it would use the IUSR_SERVERNAME account to initiallize the Principal Cotnext, but if you are using the the Integrated Windows Authentication with the Anonymous Access off can you do a Response.Write of the username the site is running as. who is logged in to the machine. Hi this has been resolved. And when it runs from IIS it runs under a small right account. Thanks You very Mush rsmacaalay for your suggession. Could you please demonstrate a more complete use of the RemoveUserFromGroup function? Its simple to use all you need is an AD UserName and AD GroupName so for example you have a username “raymund” and group name “administrators” then the usage is RemoveUserFromGroup(“raymund”, “administrators”), hope this clarifies your question. so that if either the user or the group is not found, the method returns false. Thanks for pointing that out, I noticed that as well in my codes before but forgot to change my blog post. I Keep getting this exception: System.DirectoryServices.AccountManagement.PrincipalOperationException : Information about the domain could not be retrieved (1355). THanks, Problem solved. But is there another alternative? I don’t know if in production environment I’ll be able to do this. This is a known issue with .NET 3.5 when working with groups. I had the same problem when accessing a test Active Directory in a different domain. Actually, you should probably look at using the overload if you are connecting that takes the PrincipalContext. 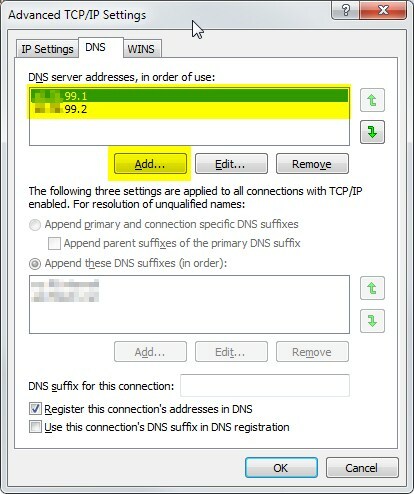 This helps the GetGroups even without the DNS server being the first in the list, or even if the computer doesn’t belong to the same Active Directory. Could you show an example of how to update for example the department field and office field using this? Can you let me know how your environment work first? Where is your code running? Whats calling it? etc. Then I guess we can start from there. I have a user in one domain – say domain A. This user is a member of a few groups in Domain A and a few groups in Domain B. The GetUserGroups function will only return the groups in Domain A. How can I get the groups for Domain B as well? Any help is greatly appreciated. You need to connect in two different PrincipalContexts which you can programatically assign in the PrincipalContext method. This means you execute User.GetGroups(PrincipalContext) in two different PrincipalContexts and merge the results. Firstly thank to teach us here. Really appreaciate what you have done. Yup, your blog is one of must see for me :). 1. My domain have deep OU level – more than 3. Let say, I have OU “Deparments” right under root, then OU “” and OU “”. Such it become contoso.edu->Departments->ComputerScience->2011. Can the GetPrincipalContext() be able to validate user just only by given root OU? 2. My domain also have other 5 sub domains, with all the domains are GCs. Can I do search/validate user just by giving the root domain with UserName complete with domain, such validate “[email protected] from root domain “contoso.edu”? 3. I have Forest level trust relation with other forest, fictionally named “fabrikam.com”. Can I validate their user using your code? What are modification that I need to do? Sorry, asking you to many questions, I just new comer to AD. Anyway, thank you very much for your articles. 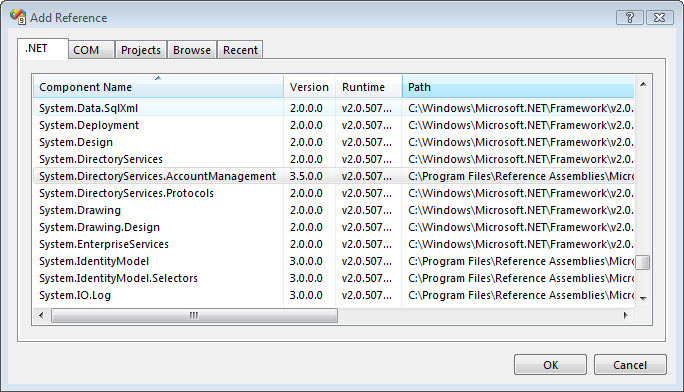 1. sDefaultOU and anything below it would be the scope of any queries or actions you do in Active Directory. So the answer on your question is yes, regardless how deep your OU is as long as it belong to the root then it will be fine. But please note that sDefaultRootOU was not used in the above code, it was my mistake. 2. You have to change sub domains by changing sDomain and sDefaultOU. And sub domains will be treated as a different repository thats why in Windows Login you are asked the option of which domain to log in to as it will not search your user credentials in other sub domains. 3. Like in item 2 you need to be specific to a domain. Thanks for the tips, 🙂 yup that answered my questions. At first I thought, when a domain is GC I do not have to specify a domian, just giving UserName with full [email protected] combination. You have clear it up for me. Just another question, do “sServiceUser” need to be a special account like domain admin or enterprise admin,or just any normal account will do? Thank you very much for the answer. Happy weekend then. I think I’ve found the answer for my forth question. Normal user account will do. Have you noticed any problems with caching? I have a project where I used these AccountManagement principals and I can’t seem to figure out how to refresh the cache. Removing items from a group is particularly visible. It takes a variable amount of time before removed items are gone which I would presume is the normal interval that the cache is flushed. groupPrincipal,Save() does not flush the local cache apparently. Hi, I am new to active directory , I have a task where i will be having user names and i nedd to fing corresponding group and ou related and second I need to move user from one group to another. How can I achive this I tried all near possibalities given in posts on internet.Hope you will reply soon for my query. Hey thanks for the code, looks like its working pretty great in VS2010 with running credentials but I cant get it work running under supplied credentials on the IIS server by enabling anonymous mode. I am fairly new to this but how could i run everything under the credentials in IIS and not a plain text file. Not a good idea to run it in anonymous mode, you either need to run it with IIS Credentials that have very defined security roles or you can do Windows authentication and let the users credentials define what methods he have access to run. How would I get a list of users and their managers using your code? You obviously need to replace the properties with your own. Sorry for the late reply was in TechEd last week anyways better late than never. Hello, ¿can i rename group of users with GroupPrincipal? gp.save(); //ERROR not possible change RDN ! RDN or Relative Distinguished Name is like a primary key on the database so you cant rename that, what you can do is change the display name but if you really want to change the name you need to drop and recreate it programatically, I guess thats what happens when you use the Active Directory Users and Computers, it just looks like you are renaming it. Thank you, I have recently been looking for details about this subject matter for ages and yours is the best I have found so far. I am hoping I can get some help here. How can I copy an AD user in order to create another AD user? For example, I have a template user that I simply want to copy and create a new user JSmith. JSmith is now EXACTLY like the template user except of course for uniquely needed fields such as username and such. Is this possible? Please assist. But would this copy everything from the original user? All groups and rights and settings, etc.? Hi Peter, while its not a good practice to copy ones credentials it will be possible but like what Thomas said you need to create a template and thats the best practice. That template can be on XML or in SQL where it defines a specific definition for the user that you will be creating. Also on your question regarding the file and folder permissions well if the file or folder was granted permission because of an AD group then it would be easy but if its granted by the username then good luck as you dont have any reference from AD what files have been granted unless you iterate to all of the files and folders and check the permissions. Hope this helps. This is great and very helpful with the application I have been creating. Right now I need the ability to create and delete computers in Active Directory. I have been able to do it using the more combersome method, but I like the cleaniness of this method you have display so well. Would you happen to have example of both methods? Oh and another Active Directory task that I like to be able to do in my application is the ability to rename a user to change the following properties: Full Name (cn), First Name (givenName), Last Name (sn), Display Name (displayName) and the User logon – we have a special formatting rule for the user logon id so I would have to create a new logon based on that rule and then set the userPrincipalName and SAMAccountName with the new value. any idea how to do that ? I am using the GetUser method as described above. When I execute the FindByIdentity method, I get an exception with “A referral was returned from the server”. I’m a newbie in terms of AD, so I’m not sure what this means. I’m using the following connection string. This was the only way I could get past “Unable to connect to server” and “Invalid Login/Password” messages. Can you give me your full codes where form your connection to the method you are using, as well as your full exception so that I can debug it. I think I have it figured out. When I specify MyDomain.local as the domain name, I then need to specify “dc=MyDomain,dc=local”. Before I had “com” instead of “local”. Can you please show a code to get all members of a group? Could you please show a code to get all users under criteria ? Since those attributes are not represented in the UserPrincipal object you need to extend it and here is my article regarding that topic http://anyrest.wordpress.com/2010/10/14/how-to-use-ad-attributes-not-represented-in-userprincipal-groupprincipal-and-computerprincipal/. Once you had extended the attributes to have employeeType and extensionAttribute you can now use the usual PrincipalSearcher like such with the combination of the library above. Hi Fred, did u solve this extensionAttribute issue ? I am trying to provide a role-based access to my intranet system using AD and different web-apps are listed as extensioAttributes. please post your solution idea. This is very good & thanks. Do you have an example of retrieving all Distribution Groups (Exchange Distribution Lists) from Active Directory? Sorry, I need the email address associated with all found Distribution Groups. I am not looking to retrieve the members of a group. I need to retreive all email Dustribution Groups (Exchange Dustributions Lists) and their associated email address. I seems that the answer in the link above referes to members of a group. an example that would be great. Any chance to search after attribute “department” for specified user? Hi great! Thanks all works fine! That’s are great article, I got some good knowledge. But one thing i need to know (sorry have no idea). what is the real / practical usage of this code. Could you please suggest any example where this trick is helpful. If youre developing some sort of Identity Mangement Solution or even just a user management then this would be a great use. Is it possible to get the password of the user.why becoz i am creating reset password webpart in sharepoint fba site.the users can change their passwords. (both fba and ad users). Congratulations for it and a million thanks for saving me of such a big effort! I am unable to find manager object based on its name property if the user and its manager are in different domain. Lets say top domain is BIG and under that we have subdomain1,2,3 etc. User belong to subdomain1 and manager in subdomain2. Search operation not working on TOP domain. At line UserPrincipal oManagerPrincipal = UserPrincipal.FindByIdentity(oPrincipalContext, strManager); oPrincipalContext belong to user who belong to subdomain1 and strmanager is the name of manager which I get from extendedUserPrincipal. This is an excellent article. Its helping me to design an application that will sync users from a DB to AD. Now i am just stuck at a problem, how do i only search for users in the entire AD. if dont know the names of the nodes. I saw in AD that there is a Type that says “USER” but i cant find this in the objects that i have from your code. The user principal handles it so no need to search by “user” unlike the old .net 2.0 way. ActiveDirectory — The name ‘ActiveDirectory’ could not be found. Great blog. very helpful, thank you very much. My question is indirectly associated with AD. Can you show some code for reads data from the syslog about AD changes and leading them to the same AccountManagment classes ? If you made this code for read/erite AD objects you most likely made and the code for changes monitoring. Thanks for providing such a simple and useful methods for handling AD. Everything is working fine except SetUserPassword Method which is not taking into account the Password History Policy of Ad. It is just resetting it to the value we provide. Unlike SetUserPassword, ChangePassword is taking care of all the AD policies. But I can’t use ChangePassword method when user is not having his old password. So in that case I have to use SetUserPassword method. Ok, but I am still wondering how the paid application like NetWrix Password Manager and AD SelfService Plus have implemented Reset Password Functionality. We have downloaded the trial version of NetWrix and tried to Reset the password by just providing the new password. It changes the password with all AD password policies taking into account including the history policy. Its been almost 2 month I am searching for the solution. Please suggest some solution, I’ll be very grateful to you. Thanks for the great post. Helped me a lot. Appreviate your time and effort. Have a question. Is there an easy way to find out all the groups and distribution list and not the users from a group. ie. X group has 5 members of which 3 are users and 2 are distribution list/groups. How to get only the 2 sub groups from the group X? I tried the following but that is not helping..
Is there an alternate or better way; just curious..
First thanks so much for your work on this. I have been using it for over a year without problems. That is until today. The WebApp I wrote last month was working on my Laptop and the Server, but today I noticed it is no longer working on the server. I have reboot, redeployed the entire webapp and still nothing fixed it. I will keep looking and post if I fix it. I hope you can help. Thanks for the fast response. As it is working for me on my laptop, just not the server as me. So I exist, and I have groups. I am passing in the current users. I just strip of the domain part. Just odd that the UserGroups is the only thing not working. Great News, I have fixed the problem. After creating a new site and pushing the code out only to find it works fine on the new site, I went back to the production site and found someone had turned on “Enable Anonymous Access”. Once I turned that off all the code started working correctly. The account management helper class works great. Do you happen to have some code that would add missing items from the UserPrincipal… something like this below. The idea would be to add all of the missing items so that they could be set in code. It would be helpful to see not only how they get set, but how they would then get used in code.. Here is some sample code…. Thx for your great effort. Good morning. I have a question ? How I can connect with Azure AD ? An Excellent code, I am new to the .Net and I am trying to update the “ManagedBy” and “GrantSendOnBehalfTo” for a group, how can I use your Code to display and update the list of users in the mentioned group’s fields? How to add user from domain XYZ into domain ABC distribution list. example : XYZuserid1 , I want to add this user into domain ABC distribution list. i.e. add non ABC user into ABC distribution list. When using this if a username has a dash “-” in it I always receive not found. even through the user can be found in AD separately. So How do I get the dash “-” to be accepted. I am having difficulties trying to retrieve groups that a user is a member of using and I’m getting a NullReferenceException at this line..
Am I trying to see if the user is a member of the ‘Staff’ group. I have verified that the user is valid already using ValidateCredentials but cannot seem to get the application to determine whether the user is a member of the group (which they are). I think either the oUserPrincipal or oGroupPrincipal is null. You need to change it to If oUserPrincipal Is Nothing And oGroupPrincipal Is Nothing then …. I’m trying to do an account unlock function using this. How would i first test the account is locked using IsAccountLocked and then perform UnlockUserAccount if the Account is locked. Thank you very much for this blog it’s very helpful. I have one question: Is there any way to identify that a particular user is loggedin in any of the windows domain clients. hi.your code works great. do you have a sample code that will get the Audit aAcount logon events. I need to create a C# program to monitor the login/Logout of users in the Domain. please help. hi raymund… i was not able to get the lastlogoff othe user. do you have a sample code for getting it. Thanks for this. Really sped things up for me today in a crash course in accessing users from code for an AD LDS setup. But the information here is just way more…readable, especially when one is just googling and not quite sure what they are looking for. I wonder…who is charge of Microsoft Documentation Format! Error System.Security.Authentication.AuthenticationException: The user name or password is incorrect. —> System.DirectoryServices.DirectoryServicesCOMException: The user name or password is incorrect.